This free walking tour of the covered passages in Paris is about 4 kilometers total and it should take you about an hour without stopping, so be sure to wear comfortable shoes. You’re better off doing your walk through the Paris arcades prior to 5pm on a weekday if possible as shops might close after 5pm and it will be less crowded. Plan for about 2-3 hours if you follow this itinerary with stopping off to take photos. Click for my perfect four days in Paris itinerary. Start off your trip at the Cadet Metro Stop, which is along the 7 line. Walk a block towards Passage Verdeau. On the way, you’ll pass La Mere de Famille, a beautiful old school Parisian confectery. Passage Verdeau is a covered arcade built in 1847 named for its founder. It is an antique lovers paradise with many antique bookshops. Even if your budget is fairly low, you can get some lovely vintage postcards from Paris. Passage Verdeau tends to be less crowded than the surrounding passages. Arcades are the precursors to modern-day malls as we know them. If you’re hungry for lunch or dinner, be sure to get in line at Le Bouillon Chartier, one of Paris’ most affordable French restaurants. The line can be long although the atmosphere as well as the food is worth it. Amazingly, Parisians actually come here, so although you’ll find tourists and an English menu (if necessary). The menu changes daily and if you’re after trying traditionally French food, be sure to stop off here. Passage Jouffroy is my favorite passage in Paris and it is one of the most famous passages in Paris for good reason. Its interesting window displays as well as the fact that it houses a hotel (Hotel Chopin), museum, and nightclub within its walls. Within Passage Jouffroy, you’ll find the quirk factor with businesses like La Maison du Roy, specializing in antique inspired decorations, as well as Cannes Fayet, which specializes in walking sticks/canes. I also have a weakness for the miniature furniture store on the corner next to Hotel Chopin. If you’re interested in staying in the covered passages, you can stay at Hotel Chopin, a charming boutique hotel in the middle of Passage Jouffroy with a friendly cat. If you continue forward, you’ll be in Passage des Panoramas, which is full of vintage stamp/coin shops as well as restaurants. Here, you’ll find one of Paris’ best restaurants for gluten free dining at Noglu. After you see the passage, exit and walk a couple blocks down towards Galerie Colbert (check hours). Galerie Colbert has limited hours as it’s part of the National Library. Its stunning marble columns might still call to you. When I visited, we were the only ones there besides a random person scurrying between rooms. 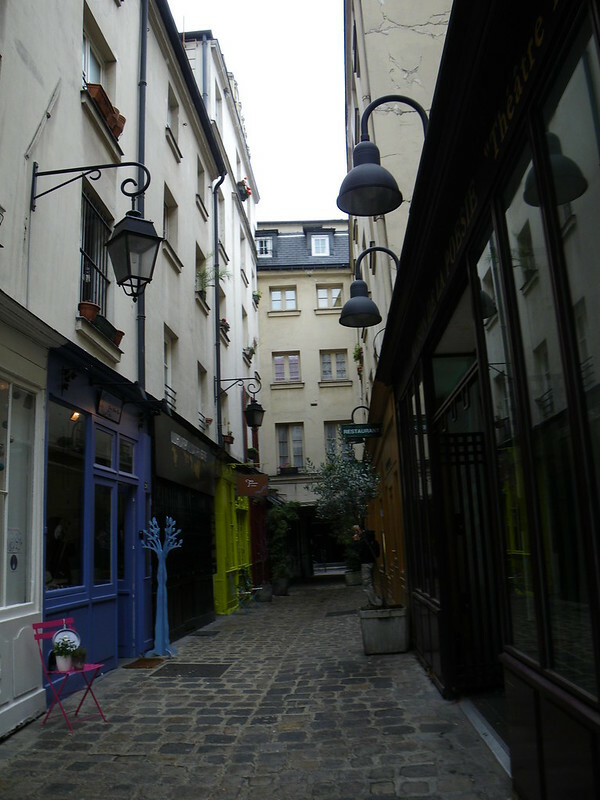 Unlike other Parisian covered passages, there are no stores here, but the atmosphere is a nice change. Don’t be deterred by the security guards although I’d avoid bringing a backpack if possible as it might cause issues. After visiting Galerie Colbert, walk around the block to see Galerie Vivienne, another famous passage although you’ll find it full of tourists. Within it, you’ll still find a variety of shops, mostly with luxury goods, although there’s some adorable used bookstores. I didn’t successfully get into the one with the miniature second story, but you’re likely to find plenty to admire within this long passage. It has multiple entrances, so just be aware of where you exit. Afterwards, walk through the iconic Jardin du Palais Royal. Imagine yourself in a movie here. This is the domain of Parisians walking their dogs although depending on which side you’re closer to, you’ll discover some galeries surrounding Jardin du Palais Royal with exclusive clothing brands as well as artisanal goods. If you’re looking for something truly unique, stop off along Galerie de Valois and Galerie de Montpensier after enjoying a relaxing stroll in the park. After walking through Jardin du Palais Royal, you’ll end up by Le Palais Royal, the former royal palace dating back to the 17th century. It’s now used by the French government although you’ll find tourists and Parisians posing on its striped columns within the courtyard. Although Galerie Véro-Dodat is a bit smaller than some of the other covered passages in Paris, I loved how quiet and serene it was. Given that you’re about to enter one of the most crowded parts of Paris, enjoy this moment and the beautiful black-and-white floor marble floor tiles. Interestingly, it was one of the first galeries to have gas lighting, an achievement at the time. There used to be more businesses in Galerie Véro-Dodat, but after after stagecoaches declined in popularity, its location close to a stagecoach hub meant that it lost a lot of businesses. There’s some clothing businesses and high-end art galleries within the gallery today. After this, you’ll be walking through a very high traffic area. If it’s almost five (somewhere), stop off at Reset. Reset is one of my favorite bars in Paris. After a refreshing drink, you can stop in at Passage du Bourg l’Abbé, one of the smallest passages in Paris, with many art galleries. Continue walking towards Passage Molière, which differs considerably from the other galleries that you’ve seen so far. It’s not a covered passage as it’s open-air, but it has cobblestones still, which gives it an old world vibe with a twist. It became famous for the theatre located there for many years, but you’ll find boutiques that cater to things that you never knew that you needed. I know it’s not technically a covered passage, but if you’re into secret Paris, be sure to stop in here. Lastly, stop in at 59 Rivoli, an artist-owned building that used to be an artist squat. Now, this building has been apportioned into artist studios and every day people can stroll in most days (besides Monday) to see the artists in action. The facade is often changing although it’s always a unique sight to behold and be sure to bring some extra cash with you as you might find some interesting art (along with stories) to bring home with you as you can discuss the work with the artists themselves. Most of the artists ask people NOT to take photos of their work without permission, so be careful shutter-bugs when visiting this off the beaten path sight in Paris. I hope you enjoyed this self guided walking tour of Paris’ covered passages and it encourages you to discover a bit more of the parts of Paris that make it truly special. Click for another local’s one day guide to off the beaten path Paris. Click for the printable version of the map. What an amazing walking tour! I currently live in Paris and have been meaning to explore the other covered passages besides Galerie Vivienne. Thanks for sharing!! I hadn’t realised they were so extensive, what a wonderful guide! Sure does look like some hidden gems here! Will keep it in mind when I next visit Paris. This is so awesome! I’m heading to Paris for the first time next month and love the idea of exploring all the little galleries and passages. I had no idea these existed, but definitely want to wander through them next month when in Paris. Is there a printable version of the directions? Thank you – this walk looks amazing. Please can you also email me a printable version of the directions? Heading to Paris on our honeymoon in a few weeks and would also love a printable map of this tour of arcades!! You’ll find the printable version within the article if you look towards the end! The passages are very nice. However, we had a terrible dining experience at Le Bouillon Chartier. One dish was inedible, the steak was chewy and hard, we sent it back, the waiter ignored us, then made a joke about it, took the utensils from my companion’s hand to show that the steak was soft, it was so hard that he spilled half of the french fries on the table trying to slice the steak! What type of waiter dare to challenge a customer like that and take the utensils from their hands? That give you some perspective of this place attitude. At the end, we complained to the maitre but he was so busy seating people. This restaurant was 100% full of tourists, they don’t really care about returning customers. I would not encourage people to dine there. Otherwise, the galleries and passages are great places to walk around. My wife and I absolutely love this post and have added this walk to our Paris itinerary. Our first time in Paris for 6 nights the first week in June, 2019. Thank you for the wonderful ideas! Makes me want to go back to Paris just for these passages!